Beautifully located on five hills among lakes, this town was the original capital of Poland. While this in itself is reason enough for its attractiveness as a tourist destination, Gniezno is also the most important town of the Piastowski Route which links places connected with the origins of the Polish state. Visitors to Gniezno admire the town’s many historical objects dating back to Mieszko I, Dabrowka, Boleslaw Chrobry and Saint Adalbert. Rated as one of the oldest towns in Poland, Gniezno maintains a unique place on the country’s map. Nearly all of historic buildings within its walls can trace their origins to the earliest period of the Polish state. Recently a number of these buildings have been renovated, helping to revive the visible historic importance of the town in Poland. Gniezno is also recognised as a significant place of worship of Saint Adalbert, the first bishop of Prague. The single most unmissable thing to see in Gniezno is the 14th-century Gothic Cathedral, with its priceless memorabilia, relics, and the tomb of Saint Adalbert that draws Catholics from all over Europe. The Cathedral witnessed the coronation of the first five Polish kings, and one can also visit the archive containing several of Poland’s earliest manuscripts. There are also several Gothic churches to see in this history-laden town, and the Archdiocesan Museum and the Museum of the Origins of the Polish State are well worth a visit. When you weary of museums, galleries and exhibitions, consider a stroll around the tranquil Lake Jelonek, one of the best places to view the splendour of the old town of Gniezno. Gniezno is located in central-western Poland, in the Greater Poland voivodship, 48 km northeast of Poznan. It is at the centre of the Gniezno Lakeland, with a population of over 70,000 and a total urban and suburban area of 40,89 km2. Gniezno is situated in the midst of an agricultural area, diversified by moraine hills and periglacial lakes and rivers. There are forests surrounding the town, as well as three relatively small lakes – Winiary (18.6 ha), Jelonek and Swietokrzyskie (Bielidlo). The latter of these lakes attracts a host of water birds. Very close to Gniezno is the Lednicki Landscape Park, protecting the most unique elements of the landscape. Gniezno is one of the most important towns in the history of Poland. It was the first capital of the nation, and bore witness to many crucial events during the establishment of the Polish state. Gniezno is also closely entwined with the origins of Christianity in Poland. Featuring on Gniezno’s coat of arms is a white eagle on a red background. The tie between the eagle and the town’s history is noted in the 13th century Greater Poland Chronicle. Legend has it that there were three brothers, Lech, Czech and Rus, who while walking through thick woods with their tribes came across a large valley surrounded by hills and lakes. On the highest hill stood an oak tree with the nest of a white eagle. Lech became immediately bewitched by this place and decided to settle there with his people. The town was built on seven hills: Lech, Saint Peter, Saint Laurence, Saint Michael, Panienskie, Krzyzackie and Zninskie. Its original name, Gniezdno, derived from the Polish word “gniazdo”, meaning “nest”. In the first half of the 10th century, Gniezno served as the centre of the tribal country populated by the Polanie. Afterwards, once the tribes began to unite, the settlement grew into a capital established by the dynasty of Piasts. The most important year in the history of Poland is 966, with the rite of baptism of Prince Mieszko I and the entire nation taking place in Gniezno. From that year on, the town was not just a capital of a newly founded country, but also the centre of a new religion in the region. 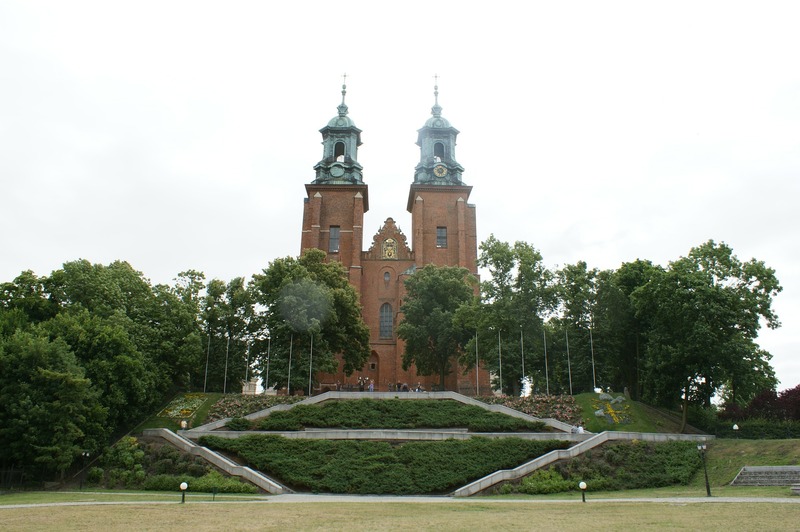 Once the remains of the martyr Saint Adalbert were interred at the Cathedral in 999, Prince Boleslaw Chrobry successfully requested the Pope to found a church metropolis in Gniezno, making it easier for him to become king. In the year 1000, the German emperor Otto III made a pilgrimage to Saint Adalbert’s tomb. The coronation of Boleslaw Chrobry took place in the Cathedral in 1025, and soon afterwards his son Mieszko II was crowned King of Poland. Before long, the more secure town of Krakow took over as capital of the state from Gniezno. Moving on to a more recent history, in the years 1939-45 different kinds of German terror were unleashed in Gniezno. The town was not destroyed during the liberation in 1945, however the one building that did suffer some damage was the Cathedral. In 1994 Gniezno was given the title “Gniezno – the city of St Adalbert”.